The Laboratories are equipped with all the resources necessary for cloning, subcloning, nucleic acid isolation, blotting and mutagenesis, including polymerase chain reaction. The equipment includes bacterial incubators, cold room, dark room, electrophoresis supplies, high-speed centrifuges, as well as commonly used and custom-made radiotracers. DNA sequencing is performed at the Sequencing Facility, part of the Columbia Genome Center. In collaboration with the Columbia Transgenic Facility in the adjacent Hammer Research Building, transgenic mice are being produced as models of human disease. The Laboratories host a dedicated microscope and work area for this area of clinical and scientific investigation. Currently, the resource is being utilized in the first step of the genetic diagnosis of Glut-1 DS, since about 10% of patients are FISH positive, eliminating the need for further genetic testing. Protein binding and kinetic studies of transport mediated by molecules of interest across cellular membranes are used as a tool to investigate the function of patient cells harboring mutations. Cells obtained from patients, mainly, but not limited to, skin fibroblasts, are propagated and expanded until functional or protein assays are performed. Gene expression and amplification studies are currently being carried out on these cells. All tissue samples with self-perpetuating capabilities are susceptible to propagation and subsequent storage indefinitely in deep freezers for future study. 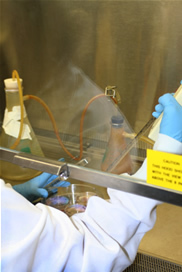 Devitalized patient samples are also maintained under optimal preservation conditions. Each sample is accompanied by an archived clinical description. Resources include ultracentrifuges, a computerized spectrophotometer, a disintegration counter, affinity purification and blotting capabilities and enzyme activity assays, of interest in certain metabolic abnormalities. The laboratory includes a two-electrode voltage clamp for use with injected Xenopus oocytes. RNA coding for a wild type or mutated molecule of interest may be injected into oocytes, normally devoid of such molecules and, after a period of incubation, the functional properties can be precisely studied. A computer using pCLAMP software controls data generation and acquisition through a Warner amplifier. The experimental setup is enclosed in an isolating cage in which several experimental solutions are ready for application to the oocyte. A temperature control system allows the performance of experiments under the desired conditions. This laboratory is housed in an octagonal-shaped glass enclosure for isolation and comfort. The vibration table contains a Nikon TE-300 equipped with Hoffmann modulation optics and epifluorescence filters. An Axopatch 200B amplifier performs voltage control and current recording and a Pentium IV microcomputer running pCLAMP 8 transforms the data for analysis. The unit includes a Narishigue microforgue and a Sutter processor-controlled micropipette puller. The computer is linked to the Internet and to a networked high-capacity drive for data backup. The Neurology internal network links the Laboratories to high-capacity backup servers and to the Internet via optic fiber cable. The Laboratories include 13 PC and 2 Mac interlinked microcomputers dedicated to the various scientific instruments or investigator desks. Most computers contain Pentium IV processors and are equipped with color printing and digital scientific presentation capabilities. New patients can be videotaped and scientific photographs stored on digital media. A public library of digital presentations by members of the Laboratories on different topics of scientific and clinical interest is being created. All patient-related information is maintained in digital databases for study. Detailed records and results of explorations with investigative value are classified by disease and subdivided by key headings, in an effort to facilitate research and to promote resource sharing. Current databases include pediatric brain tumors, MELAS and other mitochondrial disorders, pediatric neuromuscular disorders with special emphasis in spinal muscular atrophy (SMA), Glut-1 DS, sickle cell disease and other poorly understood conditions still being defined and characterized. All of the NIH-funded clinical trials are coordinated to allow clinicians and scientists maximum interaction with patients who chose to participate. Research patients are either brought to the Irving Institute for Clinical and Translational Research, a comfortable, patient-oriented facility that includes a Pediatric branch at Children’s Hospital of New York or to our affiliated space at the newly designed spacious Spinal Muscular Atrophy Clinical Research Center. Currently natural history studies are being conducted that expose patients and family members to a variety of diagnostic and quality of life assessments performed by highly skilled investigators and staff. Over time, entire families have elected to participate in the studies culminating in the elucidation and treatment of numerous neurological and other diseases.